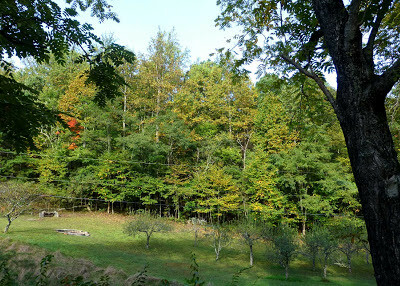 The second week of October in our neck of the woods near Asheville and Black Mountain, North Carolina, is usually one of those weeks where the color will either slow down or speed up, a week when a few wind gusts may knock down the “early changers”, leaving those trees with bare branches while others are still mostly green, and a week when the air feels noticeably crisper but sunshine can make the days bright and warm in the afternoons. Fall of 2012 is turning out to be quite the colorful season, and good color can be found this week and through the weekend at elevations higher than 4,000 feet. 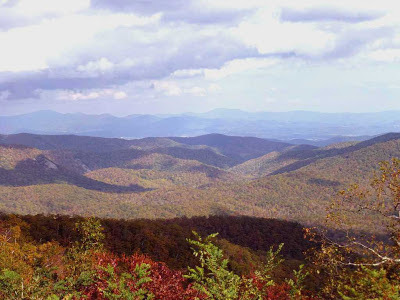 Starting from the Inn on Mill Creek, take a scenic drive through Old Fort on Hwy 70 and turn left onto Hwy 80, which curves 12 miles north to the Blue Ridge Parkway. Then turn left (south) on the Parkway at Milepost 344 and drive to Mt. Mitchell State Park, located off the Parkway at Milepost 355 (Hwy 128). From Mt. 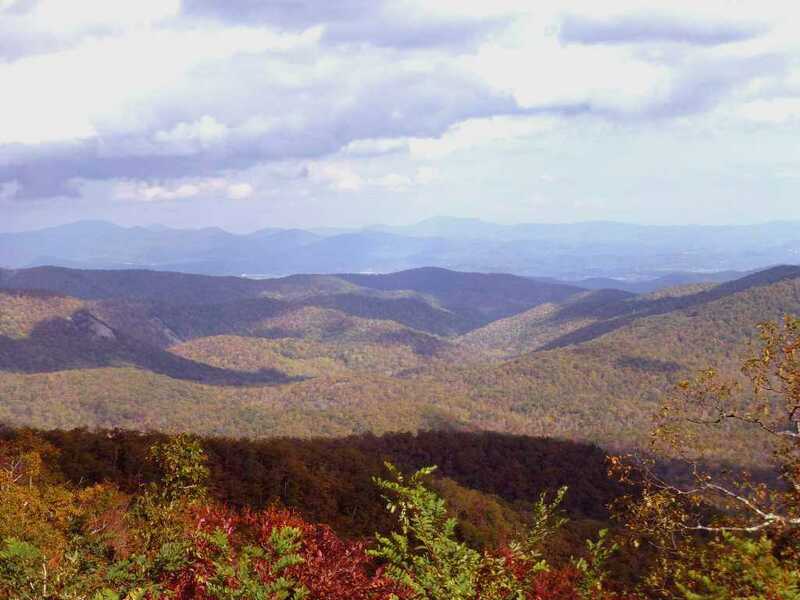 Mitchell, the highest peak in the eastern United States, you have sweeping views of the Black Mountains, which contain not just one, but six of the ten highest peaks in the eastern U.S. Elevations between 4,000 and 6,000 feet will show the most color, including areas northeast toward Grandfather Mountain. Want to get out for a hike? A nice trail is the portion of the Deep Gap hike from Mt. Mitchell to Mt. Craig. When you leave Mt. Mitchell State Park, keep traveling south on the Parkway, passing the Craggy Gardens area and head back toward Asheville. If you have time, stop in at the Folk Art Center at Milepost 382. American Craft Week runs through October 14, and the Folk Art Center houses some of the best craftwork of the Southern Appalachians. Exit the Parkway shortly after the Folk Art Center onto Hwy 70 and take that route into Black Mountain, where you can have dinner at one of more than a dozen fantastic locally-owned restaurants before you return to the Inn. Starting at the Inn, head on I-40 east to exit 55 and take Hwy 70 to the Blue Ridge Parkway. Travel south on the Parkway. Stop in at the Blue Ridge Parkway Destination & Visitor Center at Milepost 384 to learn more about the Parkway. This section of the Parkway is nice because you travel around Asheville on a pretty, tree-lined route with several different types of trees and their various shades of fall colors. The North Carolina Arboretum is on the way to Mt. Pisgah, at Milepost 395 (Hwy 191). It’s worth a visit to the Arboretum to view their Bonsai exhibit this time of year and check out the miniature trees changing color. (We’ll feature the Arboretum later in the month, when Asheville gets closer to peak color). Along the way to Mt. Pisgah, you’ll pass through several neat stone tunnels, and you’ll also be treated to gorgeous views and beautiful vistas. Once you reach Mt. Pisgah at Milepost 408, there is a great restaurant called the Pisgah Inn, which is open for lunch and dinner through November 3 (it then closes until April). Its dining room has one of the best views in the area, so reservations are highly recommended! Before grabbing a bite to eat, you can build up your appetite with hike on the 1.5-mile Mt. Pisgah Hiking Trail that leads from the parking lot.